Here is the party line about the Mets payroll situation. In 2017 the Mets went all in. The opening day payroll was $155 million which was an all-time high. After losing 92 games the Mets need to make some cutbacks in 2018 since the spending spree failed. On the surface, this notion makes sense. The Indians and Astros each opened the 2017 season with payrolls in the $124 million range and made the World Series. The belief that high spending is a guaranteed way to yield more wins is not accurate as both of these teams were below the major league average. The Tigers and Giants tied for the most loses this past season with 98. They ranked fourth and seventh respectively in opening day payrolls. The teams with the two lowest payrolls were Milwaukee and Tampa. Each of these teams was in the playoff hunt into September. 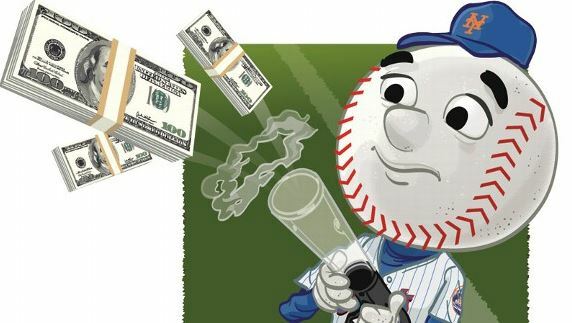 Going into the current offseason, the Mets had very little money in committed salary. In total the Mets were paying just $58.5 million to 5 players. Now that the Mets picked up the options on Cabrera and Blevins as well as sign Swarzak, the total amount in guaranteed salary increased to $76.5 million. At this point, the Mets need to factor in arbitration. An exact number is impossible to give at this moment, but most projections assume that this will increase the payroll by around $50 million. Toss in a few more players like Rosario and Smith who will make around the league minimum and we have a general idea of what the payroll will be. If the Mets don’t make another move for the rest of the winter, the payroll will be in the range of $130-135 million. This is roughly the same as 2016. The Mets starting rotation is entirely under under team control. Despite these facts, the fan base is currently enraged by the status quo. The ownership is being criticized for being stingy. Is this rage justified or not? A deeper look at the numbers shows that the fans have a rational point. There are several reasons why. To begin, one needs to take a step back and give some perspective. While the Mets did set an opening day record on the $155 million payroll, this is nothing special by current standards. The MLB average payroll was $137.7 million and the Mets just ranked twelfth. In addition, the 2017 Mets ended up with a lower payroll than what they started with. Due to the many salary dumps, the final payroll number was actually $154 million. While this doesn’t look seen like a big deal, it is. Focusing exclusively at the opening day payroll doesn’t include the players who are added as the season goes on. For example all the players called up due to injury as well as September call ups aren’t calculated in the opening day payroll. This totaled about $6 million. The end of season payroll includes the roughly $11 million that the Mets gave in signing bonuses to draft picks and international signings. The average team in baseball increased their payroll by about $14.5 million as the season went on and the Mets were one of just four teams to shrink. If you look at the end of season payroll, the Mets were ranked a mere fourteenth overall as the MLB average jumped to $152 million. The official payroll numbers don’t include one major point. David Wright’s contract has an insurance policy. For those not familiar with this, the Mets are refunded 75% on Wrights contract for games spent on the DL. The only condition is that he spends at least 60 games on the DL. Without getting lost in the accounting, the Mets have been able to refund much of his contract since 2015. In 2017, the Mets got the maximum and only paid $5 million on Wright’s contract. In reality the Mets payroll on opening day was therefore only $140 million. David Wright after a rehab game. Thanks to an insurance policy, the Mets only paid 25% of his 2017 salary. Currently, baseball is awash in cash. People simply love the sport and are willing to dish out the big bucks. After a fantastic deal with Disney, each MLB owner will each receive a bonus of $50 million. While any day someone gives you a $50 million check is a good day, the owners who are cutting payroll need to answer the most basic question. Where is that money going? Are you just lining your pocket or investing in the team? The Wilpon’s are not the only owners who will need to answer this. However a lot of people will ask questions when you are in the biggest sports market in the world, making cutbacks and getting a huge check. Lastly, we need to ask what about the revenue? Not many people realize this but SNY is the premiere team owned sports channel in baseball. In 2013 Bloomberg ranked SNY as the most profitable regional sports network and valued at over $1.1 billion. Prior to this past season Forbes ranked the Mets as the sixth most valuable baseball organization. Add in that we have the fourth most modern ballpark in the game and one has to ask. Where is all that money going? Why is the team making cutbacks? Citi Field during the 2015 World Series. It opened in 2009 and is currently the fourth newest ballpark. The truth is that we don’t have any concrete answers. The Wilpon’s do not disclose finances on the team nor Sterling Equities. In fact, Sterling Equities doesn’t even have a Wikipedia page. No one knows exactly how much money the Wilpon’s lost with Madoff. When all is said and done, the fans can only speculate and be outraged as to what they see as penny-pinching ownership. Perhaps the Wilpon’s should do what many business owners do in times of crisis. Be honest, address the fans and have a conversation about where the team is headed in the near future.